Is camp pie truly Australian? The Oxford dictionary says so, defining it as: (Australian, history) tinned meat. And it certainly has a long (if not glorious) history in this country. Tinned meats were adopted enthusiastically in the late 19th and early 20th century, when domestic “refrigerators” relied on regular visits from the ice man. 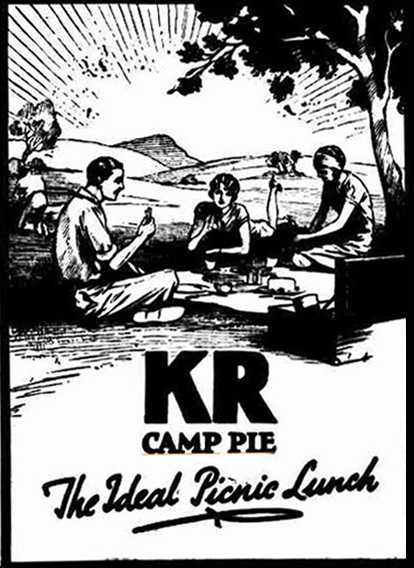 Even in the 1950s, camp pie regularly appeared on Australian tables, sliced cold and served with salad, fried, or disguised in a variety of inventive recipes. But it probably isn’t uniquely Australian. Camp pie (at least in its tinned version) is recorded in Britain long before being manufactured in Australia. The term may have originated with the military, as tinned meat became a staple in the military diet around the time of the Crimean War (1853-6). Another theory (which would support its Australian credentials) is that it was made in miner’s camps on the Australian gold fields, but I can’t find any evidence for this. The meat canning industry in Australia developed to solve a problem. By the 1830s, the supply of meat animals exceeded domestic demand and prices were low. Before the advent of canning, and with refrigeration well in the future, surplus stock were slaughtered and boiled down for tallow – the animal fat used primarily to make candles and soap. The waste meat from this process was often used as fertiliser. Canned meats from Britain first arrived in Australia in 1815 but the first local experiments with canning didn’t take place until the 1840s. As processes improved, many canning plants were established and by the decade 1869-79 the Australian meat preserving industry was exporting some 65,000 tons of preserved meats to England. Ingredients. — Cold beef or mutton, pepper and salt, seasoning of ketchup or Worcester sauce, and an onion if liked. Method. — Mince the meat very fine, add pepper, salt, and the onion finely chopped. Make gravy of the bones and flavour it with ketchup or Worcester sauce; mix these with the minced meat, put it into a pie dish, with a tolerably thick layer of mashed potatoes, well seasoned with pepper and salt, and bake for an hour. 1 lb. sausage meat, 1 cup soft breadcrumbs, ¼ lb. bacon (rather fat), 1tablespoon Worcestershire sauce, 1 cup milk, salt, 2 hard-boiled eggs for garnishing. Cut the bacon into dice. Mix all the ingredients together in a bowl. Turn into a greased basin. Tie greased paper over the top, and steam for 2 hours. Unmould, and allow to become cold and firm. Cut each egg into four lengthways, and garnish the dish with these. This latter recipe would produce something closer in texture to the tinned Camp Pie, which had been imported as early as the 1870s. Well respected brands included Maconochie Brothers of Lowestoft in Sussex, Shippams of Chichester and Glencairn Camp Pie from the firm of Cunningham and De Fourier in Glasgow. From the 1890s, St George Camp Pie was also imported from New Zealand. These companies typically produced a range of potted and tinned meats. Advertisements in Australian, Canadian and United States newspapers in the 1870s and ‘80s promote a range of imported English luncheon meats including ox and sheep’s tongues, jugged hare and roast grouse as well as the more common ham and corned beef. Although camp pie in various guises had been around for many decades, it appears that Foggitt Jones of Queensland were the first to market it in Australia.Their Rex Camp Pie became a well-known brand. The famous “Camp Pie” Case in the 1920s was a legal dispute over trade marks between Foggitt Jones and the Darling Downs Co-operative. Foggitt Jones commenced trading in 1904 in Brisbane, initially producing hams but moving into meat canning. According to a 1916 newspaper report, their product range had grown to include ham pate, veal and tongue pate, pigs’ feet, camp pie, pork and beans, pork brawn, Lorraine sausages, pork sausages, pork and veal Fritz and luncheon cheese (an early form of cheese spread). The company later expanded their distribution and production facilities to Sydney, Perth and Adelaide. Although Foggitt Jones may have been producing camp pie before 1910, an advertisement touting Rex Camp Pie as a new product appeared in the Brisbane Courier in October 1915. Other manufacturers soon followed. In the 1920s, Foggitt Jones took the Darling Downs Co-operative to court, claiming their trademark had been infringed by the co-op’s KR brand, which had used a similar scroll on its label. The judge, saying “camp pie is camp pie”, threw out the case. Foggitt Jones appealed – and had the judgement reversed. The Darling Downs company took the matter to the High Court of Australia, but Foggitt Jones’s appeal was upheld. The case gained considerable coverage in the newspapers of the day. Subsequent Australian brands of camp pie included Tom Piper, Swift, Smorgan’s (who also supplied frankfurts to the military, dubbed by soldiers as “Smorgan’s organs), Imperial and the Heinz brand, Hamper. Initially camp pie was supplied in round tins, but in 1955 Top Piper announced the introduction of “the latest American-style square cans”. These were opened with a key that rolled back a strip of metal around the side of the can. well. Put mixture into base of greased ovenproof dish. Top with baked beans. Make up instant potato according to directions on packet, spread over baked beans. Sprinkle potato with grated cheese. Bake in moderate oven 25 to 30 minutes, or until cheese is golden brown. Serves 4.